Title: Bringing up the rear behind BNSF 7207 and BNSF 6717, BNSF 6715 as a rear forward DPU pushes the Z Train up the Kingman Grade. Title: BNSF 6715 as a rear DPU pushes this Hot Z up the grade. Title: A Very Very Brand New BNSF 6715 heads westbound as a rear DPU on this Hot Z Train. Title: Up Front Cab shot of a Very Hot and Brand New C4 as she heads east as a rear DPU. Title: Up close shot of a Very, Very Brand New ES44C4 BNSF 6715 being utilized as a rear DPU on a westbound Z and probabley on her First Revenue Run Too!!! Description: The large cut that the BNSF Railways Southern California Christmas Train is about to pass was, until 2007, the western-most of the two tunnels at Alray on Cajon Pass. The tunnels were removed when this portion of the line was double-tracked (adding a third mainline to BNSFs busy crossing of this pass). When our train reached Summit, where all three mains are together again, the Christmas Train held the center main (where we would reverse direction) while another eastbound passed on our left and a westbound passed on our right. What a thrill it was to be on the business cars open platform for that! Description: As dawn breaks in the east, volunteers are already well underway preparing for a busy day on the roads annual Southern California Christmas Train. Snacks need to be stocked in the three cars that will be carrying local disadvantaged children, decorations adjusted and lit, balloons inflated for the balloon sculpters, costumes donned, sound systems readied, goodie bags prepared (BNSF teddy bears!) and, of course, all the standard railroad safety checks performed. In just a few hours, the first trainload of excited children and their parents will be climbing nearby Cajon Pass - for most, their first time aboard a train. And the entire process will be repeated in the afternoon on this December 17, 2011. Everyone riding the train today will leave with a smile - including the crew! 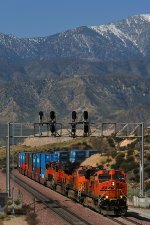 Description: A four engine stack train coming up from the LA area seen passing through a signal bridge with the San Gabriel mountains behind. Description: A four unit BNSF Stack train coming up the hill from the LA area carrying mostly blue boxes. Description: The little maple sapling in the foreground tries to imitate the BNSF coal train swinging back to the original right of way where Osage Jct used to be. Title: BNSF 5423 and other's sit in the Pit at Argentine yard..